Everyone wash up your jade eggs, take off your shoes, and down a handful of supplements, because this week’s episode of DirtCast is all about wellness! After a typically lively discussion of the week’s dirtiest dirt—including Ryan Seacrest’s boring new gig and Ja Rule’s disastrous attempt at starting a music festival—Madeleine and I are joined by Jezebel writer Stassa Edwards for a discussion inspired by her wonderful piece on Goop from last week. 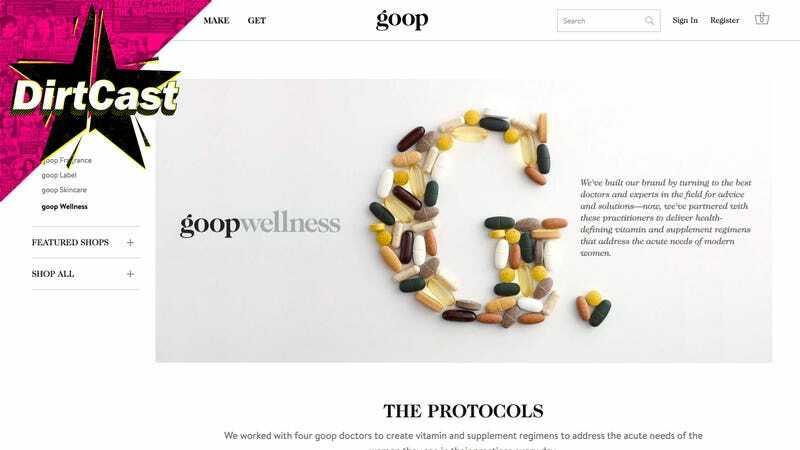 Edwards researched Goop’s strange and frequently misguided approach to “wellness” by reading “almost everything they published over the last two or three years,” including warnings about countless epidemics (like chronic stress and adrenal fatigue) and Q&A’s with detox-obsessed experts like Dr. Alejandro Junger who claim that just about everything—from airplanes to antibiotics—are giving people cancer. Goop, which sells pricey packs of supplements and other wellness-enhancing items on its website, relies heavily on the romanticization of the East for much of its advice—an approach that has been used “for a really long time” by plenty of other snake-oil salesmen. But, as Edwards wrote in her piece last week, “Goop’s wellness model is built to endure.” So we’ll probably need to have her back on the podcast the next time Gwyneth breaks news about the latest ailment secretly ruining the lives of rich people who have nothing to do with their lives but worry. DirtCast can be found on Apple Podcasts, Stitcher, Spotify, Google Play, and iHeart Media. You can read Stassa’s work on Jezebel here and follow her on Twitter here.